OK. so I keep seeing all these beautiful cards made out of acetate. I had to try. Here's my version. 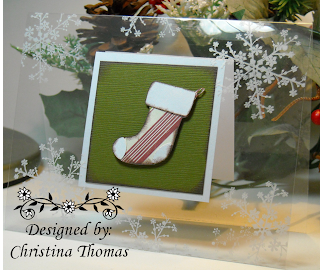 The little stocking is from the Christmas Cheer Cricut Cart. What would I do without my Cricut. The paper on the stocking from the FaLaLa collection. I made 2 sets of these for Christmas.